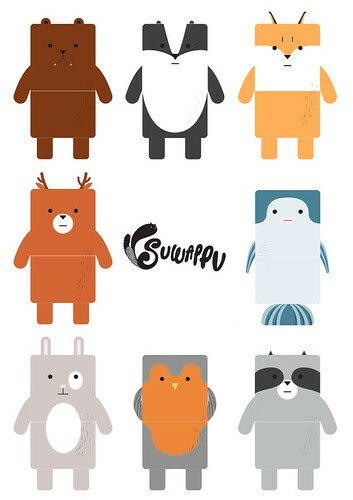 Suwappu is by Dentsu and by Berg. Deer: <Ping> We're running out of time - please help. Badger's dreams are getting worse! They turn to go, sunshine and lamplight glinting from the dust hanging in the air at the crossroads. In a clearing stands a Bear with teeth and a Rabbit who looks like a gentleman-pirate. It is always raining on Bear, but Bear is from the mountains and doesn't mind. Bear jumps <Thrummm!>, silently, points. But says nothing. Bear and Rabbit tap their Oyster cards as they enter the tube. Owl and Raccoon are together by a river. Raccoon is the trickster-fixer. Owl is a mentat with his wings carefully folded behind his back. Owl pauses, thinks. Owl: <chirp!> His fears, the eyefires threaten us all. We will help. Raccoon: <Nanng!> I found this boat - lets get going! Quik! Rabbit: <Tong!> Tube broken. Stupid warrens in ground. Bear sighs and waits quietly, but Rabbit simmers impatiently. Owl and Raccoon are in the boat, drifting down the river. They fall into a pointed silence. Owl and Raccoon's boat gently runs aground as the river widens out onto a vast plain with a settlement to one side. On the shore are Deer and Fox. Deer: Can you help Badger? Deer boggles: He *needs* us. Deer frowns. Then Owl blushes. The ground shudders, and Bear-Rabbit and Rabbit-Bear spring from a hole. It's quite a party. Eventually, they all swap back. Badger, despite some recent unsettling news, is starting to feel a bit happier because he can see that the others love him. Perhaps these lasers can be put to use fighting crime.